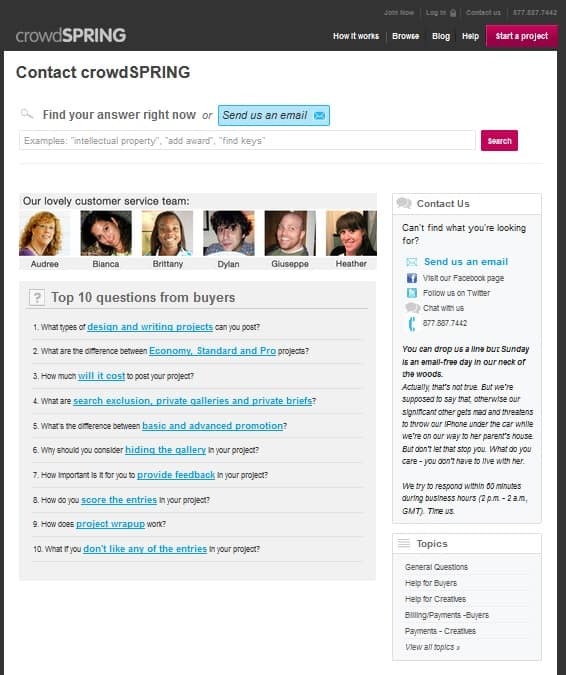 CrowdSpring is the 3rd largest marketplace for crowdsourcing design. But their relatively smaller community compared to their larger counterparts affords you a more hands-on team, with more personalized consultations for your project. As a result, they see a higher user satisfaction rate and a greater array of designs for you to choose from. Also unique to CrowdSpring is their naming service, which enables you to tap on the creative juices of over 100,000 contributors to pinpoint an extraordinary name for your brand. CrowdSpring is a basic, solid, and reliable logo design content service. It delivers the logo of your dreams, while avoiding many hurdles. Their excellent brief, pricing system and community of experienced and skilled designers make this platform unbeatable. Don’t expect too much sophistication or exceptional aesthetics! However, the prices and quality of design balance each other out. They often beat competitors’ prices, so we warmly recommend you to check them out. Read on to learn what CrowdSpring is all about. With most logo contest sites and design quality, you get a mixed bag, from the Good, the Bad, and the Ugly. CrowdSpring is no different to others in this aspect, with varying quality levels. The CrowdSpring brief could use more detail, which is disappointing when you’re looking to give your contest participants as much information as possible. They do have one neat feature, though – the option to choose which file types you’d like to receive in your final package. The designer profiles section has a number of filters that allow you to easily find the person you’re looking for. Though the designers aren’t rated, they each have a portfolio, so you can see their work and invite them to join your project. A few more features are available at the contest stage. This includes “presentation” pages for art directors and project managers or, more importantly, “focus groups” for getting your colleagues’ input. The CrowdSpring website is easy, simple to navigate and makes the most out of a straightforward design to still give off a professional feel. As a visitor you might find it annoying that most contests can’t be viewed unless you register, but when you’re a customer trying to conceal your new logo from competitors, this may actually be a plus. The contest building interface is nice, and lists all your potential upgrades and add-ons on the order form itself – which also includes your brief. You can review your order before proceeding to the payment stage which will launch your contest. After you’ve rated, commented, shared your entries and finally picked a winner, you and the designer will have 30 days to finalize the order and make small changes before you receive your finished logo. The CrowdSpring award-winning support is just awesome. They have every contact avenue you can think of and then a couple of more, like a Facebook and Twitter account that clearly also functions as a customer service venue. The FAQ is about as detailed as it can be, there’s live support available on the order form and beyond and the website is helpful enough to list their office hours together with their phone number. Don’t be surprised if you get a reply on a Sunday, though – CrowdSpring is just that good. CrowdSpring’s pricing system is somewhat confusing. This is partly due to the fact it differentiates between project types. This increases your options for additional project management and packages, while influencing the number of entries and designers you can expect. That being said, we believe CrowdSpring’s Silver option is actually very good. It will let you gain exposure to numerous designers, competing for cost-effective prices. CrowdSpring is a reliable service, with many of the previous usability glitches gone since the redesign in September 2017. Their creative brief and quality of designs are satisfactory, but not remarkable. The one place where CrowdSpring truly stands out is their impeccable customer support. They also offer competitive prices, so getting a new logo becomes affordable even for a small business. Emily is a Web Designer and Art Director. She is experienced in creating Brand strategy and marketing collateral for both big and small organizations.